Support will help to fight senior hunger and isolation along the Mendonoma Coast. Senators, 5th District Supervisors, City Councilmembers and Congressman will be invited to visit our dining site and volunteering for Meals on Wheels throughout the month of March to see first-hand how vital our program is to our rural, isolated communities. 5K March for Meals Walk at the Gualala Point Regional Park on Saturday, March 23 at 10 a.m.
Spaghetti Dinner on Friday, March 29, from 5-7 p.m. at the Veterans Memorial Building in Point Arena—the dinner is being hosted by the Arena Union Elementary School teachers & staff. that amended the Older Americans Act of 1965 to include a national nutrition program for seniors 60 years and older. Since 2002, community-based Meals on Wheels programs from across the country have joined forces for the annual awareness campaign to celebrate this successful public-private partnership and garner the support needed to fill the gap between the seniors served and those still in need. Help us raise awareness this March by getting involved. Volunteer, donate or help to keep our social media campaign alive. Visit www.coastalseniors.org for more information. Coastal Seniors would like to thank Arena Union Elementary School Teachers, Staff and their volunteers for a delicious spaghetti dinner this past Friday night in Point Arena. The dinner was a wonderful way to cap off our month long March for Meals celebration. The weather was amazing and, based on the crowd, it looked like a lot of people took advantage of the break in the rain to get out. As always, Bob Shimon and his group had two wonderful sauces to accompany their pasta, fresh salad bar and garlic bread. Diners were not disappointed! Bob even took advantage of a break in the action to hang out in the dining room for a while catching up with friends and former students visiting from out of town. Coastal Seniors truly appreciates Arena Union Elementary's continue support (and the delicious food!). 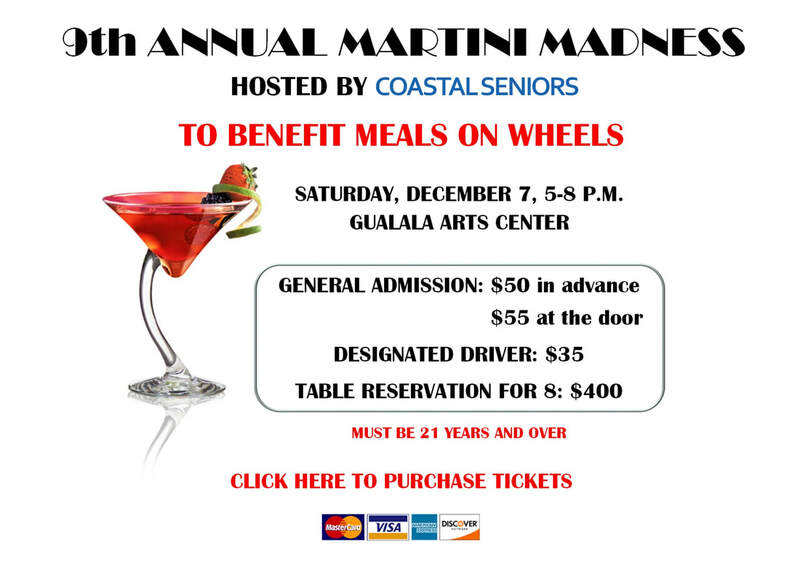 As always, special thanks to Surf Market and Gualala Supermarket for their support. All are welcome, see our menu below for more information. Seniors 60+ suggested donation of $4 for hot food and/or $4 for salad bar. Non-seniors: required $5 each for hot food and/or salad bar. Under 12: $3 each. No one will be denied food due to an inability to pay. Lunch is served from 11:30 a.m. to 12:30 p.m. at the Veteran's Memorial Hall. Hot meal service ends at 12:20 p.m. Same details as Point Arena Senior Lunch, see our menu below for more information. Check out the Pay N Take Clothing Room - it's open every Tuesday from 11:30 a.m. to 1:00 p.m.; proceeds benefit Coastal Seniors and our local food banks! Click here to visit Meals on Wheels America and learn more about why MOWA is so important to senior centers across the nation.